AAJ KUCH TOO FUNNY KARTE HAIN !! 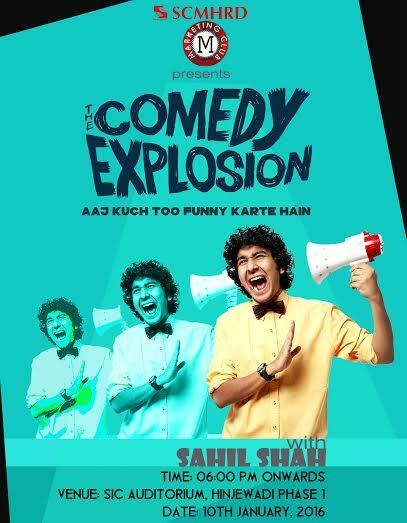 Marketing Club, SCMHRD presents to you COMEDY NIGHT with SAHIL SHAH – One of India’s youngest, wackiest and most kickass stand-up artist from East India Comedy. Sahil is one of India’s youngest professional comedians. He refers to himself as a child stuck in a man’s body. Sometimes the child disagrees with this. His puns and unruly curls make Sahil Shah a unique combination of a Lasith Malinga look-alike with a crazy sense of humour. He is the only person alive whose hair has been frisked at an airport. Sahil has also appeared on Channel V’s U R Fired as one of the funnymen. As a stand-up comic he’s seen regularly at the Canvas Laugh Factory (previously The Comedy Store), NCPA and a number of pubs and clubs across the country. We are also on Youtube ! FORE School ties up with European Institute for Asian Studies Luxembourg, for collaborative research.